PeaceCast Recorded Live: "Covering the Conflict from DC"
This is a special episode of PeaceCast. For the first time, APN recorded before a live audience in Washington DC. We partnered with one of Israel’s most popular English language podcasts, the Tel Aviv Review. 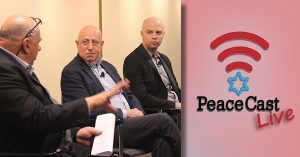 We recorded it on March 7th 2019 at the Carnegie Endowment for International Peace. The event was organized in partnership with J Street. We hosted two journalists, Israeli journalist Amir Tibon of Haaretz and Palestinian journalist Said Arikat of al-Quds. Haaretz is published in Tel Aviv and al-Quds is published in Ramallah, in the West Bank. Amir and Said are the Washington correspondents of their newspapers. The idea of this conversation was to explore how Said and Amir both cover the Israeli-Palestinian conflict from Washington. This episode is released simultaneously on PeaceCast and on the Tel Aviv Review.